This year in the Mirror of the World exhibition, you can see a treasure from the Library’s collection from the Islamic world: a manuscript containing Saʿdi’s famous poems the Gulistan (‘The Rose Garden’) and the Bustan (‘The Orchard’), copied in the year AH 1258 (1842–43 CE). In 2012, the Library held an exhibition of Persian manuscripts entitled Love and Devotion: From Persia and Beyond, which drew on both our own collection and the riches of the Bodleian Library at the University of Oxford. This exhibition was co-curated by specialist guest curator Dr Susan Scollay and the Library’s Senior Exhibitions Curator Clare Williamson. 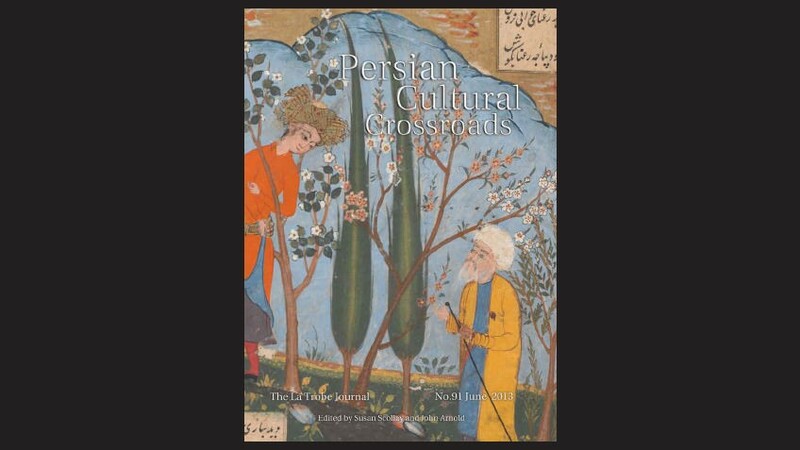 Dr Scollay was also the editor of the publication that accompanied the exhibition and the special issue of the La Trobe Journal that published the papers from the associated conference, Persian Cultural Crossroads. The State Library of Victoria’s collections have historically revealed a Western emphasis, reflective of both the Library’s origins and of broader attitudes throughout the 19th and much of the 20th centuries. Recent years have brought opportunities to redress this imbalance and better represent diverse cultures in our Library, which serves a vibrantly multicultural Victorian community. 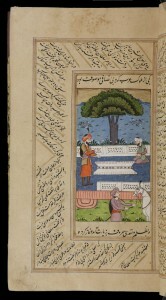 As part of the preparations for the 2012 exhibition, the Library was able to acquire four Persian manuscripts for its collection – the copy of Saʿdi’s poems shown in Mirror this year, Amir Khusrau’sKhamsa (‘Quintet’, 1599–1600 CE), Nizami’s Khamsa (‘Quintet’, 1509–10 CE) and the anonymous Tutinama (‘Tales of a Parrot’, 1808–09 CE). The acquisition of these manuscripts, the latter two made possible by the generosity of donors through a special Library Foundation campaign, has created a small but valuable Persian-language collection for the Library, which can be studied and appreciated by scholars and general audiences alike. A native of 13th-century Shiraz (in modern-day Iran), the poet Saʿdi travelled extensively throughout the Islamic world. He returned to his hometown for the last decades of his life and embarked upon his most productive years as a writer. Saʿdi is best known for his moralistic works, Bustan (1257 CE) and Gulistan (1258 CE). 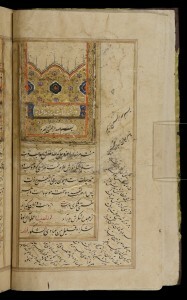 Produced during the final years of the Mughal era in the 19th century, the Library’s manuscript reflects the continuing place of Persian poetry and language within Indian culture (India was part of the Persianate Mughal Empire from 1526 to 1857, during which time Persian was its courtly language). It presents the two great works of Saʿdi: the text of the Gulistan is written within the central panel of each folio, with that of the Bustan running at an angle throughout the borders. The manuscript is illustrated with 18 miniature paintings of the Kashmiri style of the 19th century and the text is in a fine nastaʿliq script. 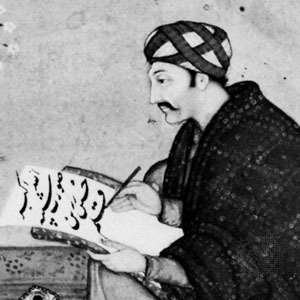 The Gulistan, written in elegant prose and verse, and its companion work the Bustan, in lyrical verse, are collections of poems and stories with moralistic and didactic themes. Both works consist of pious stories and advice for everyday life in the form of fables addressed to princes, and also contain autobiographic information about their author (though scholars agree he exercised much poetic license in incorporating such anecdotes as a method of enhancing his arguments). The tales are infused with Sufi mystic ideas and imagery that were widely accepted and understood in literary and intellectual circles in Iran and neighbouring regions at this time. In describing his poetry, Saʿdi commented: ‘A rose will only live five days or six, but this rose garden will remain fresh forever’. This beautiful manuscript is on display until September 2015. Note: Dates from the Islamic calendar are indicated by the designation AH and those from the Western, or ‘common era’ calendar, by CE.